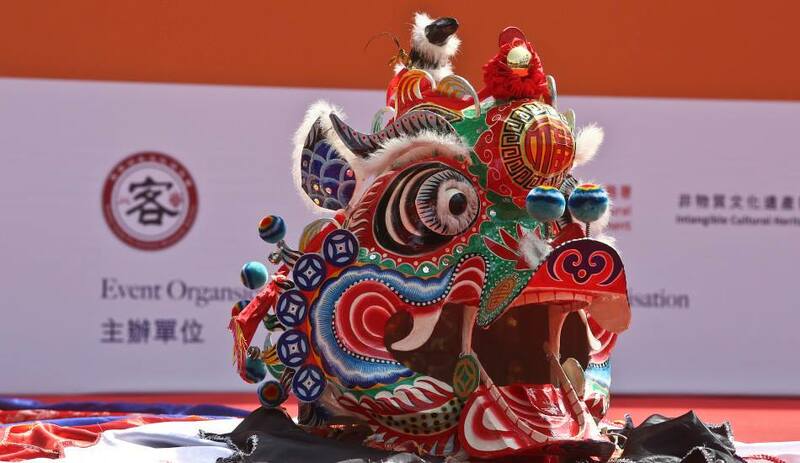 There's more to Chinese New Year than just ang pows and lion dances! However, did you know that each dialect group also observes the festival in their own unique ways? 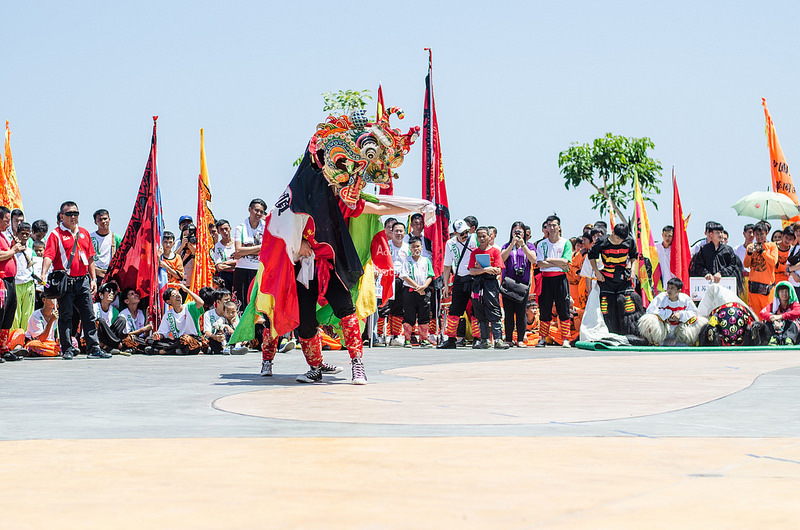 The Hakka unicorn dance being performed in Sabah. Due to our differences in cultural influences, certain practices, rituals, traditions, and even food items served during CNY can differ from one dialect group to another. Often, these practices are a reflection of our ancestors' beliefs and geographical origins. While some of these customs are still widespread and are even assimilated into other cultures today, others have may been forgotten or dismissed as mere superstition in modern times. Fatt choy braised with flower mushrooms, sun-dried oysters, broccoli, and pork. 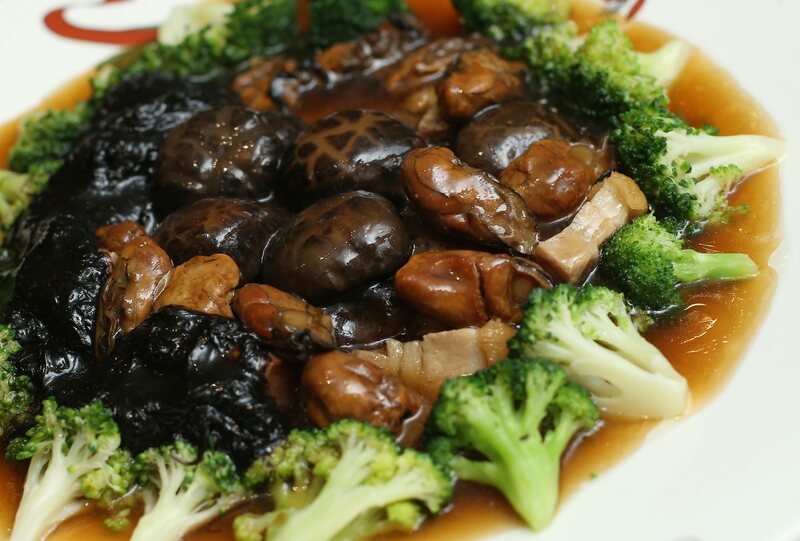 A Cantonese reunion dinner is not complete without fatt choy, a hair-like black fungus signifying prosperity that's typically braised with broccoli, mushrooms, and dried oysters (good news). Other symbolic food items include fish (prosperity, unity, and surplus), dumplings (good fortune), and spring onion (intelligence). It's also important to leave leftovers for the next day to signify overflow of prosperity and the continuity of balance. Known as "chor yee" in Cantonese, some consider the second day of CNY the actual beginning of the year and will also offer prayers to their ancestors and gods on this day. It is also believed that the second day of CNY is the birthday of all dogs, hence some will remember man's best friend with special treats. The celebration of Renri dates back to the Han Dynasty and has its roots in Chinese mythology. It is said that Nüwa, the goddess of creation and restoration, created human beings on the seventh day. As such, the seventh day of the first lunar month (Zhengyue) is celebrated as the "common birthday" of all human beings. The goddess Nüwa creates humans. 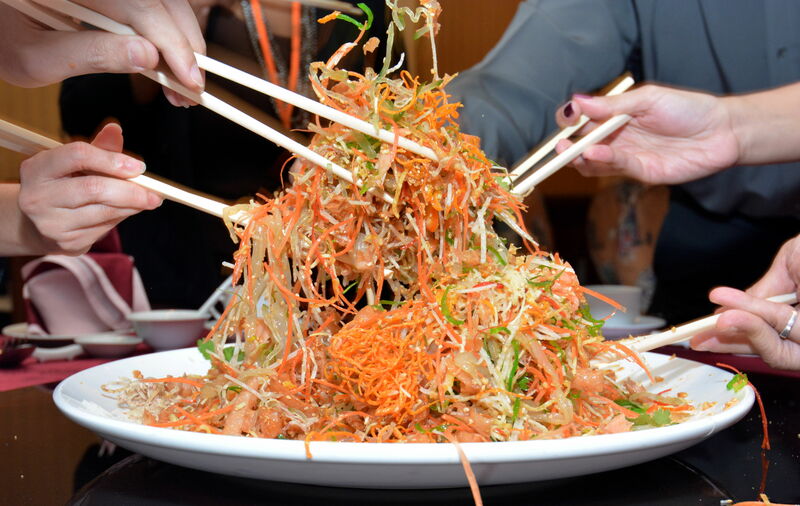 While the Chinese in Guangdong traditionally prepare seven-vegetable soup or congee, overseas Chinese communities in Southeast Asia toss yee sang (traditionally a seven-colour fish salad) instead for continued wealth and prosperity. Main ingredients for yee sang include a variety of julienned vegetables, plum or sweet and sour sauce, crackers, and slivers of raw salmon. 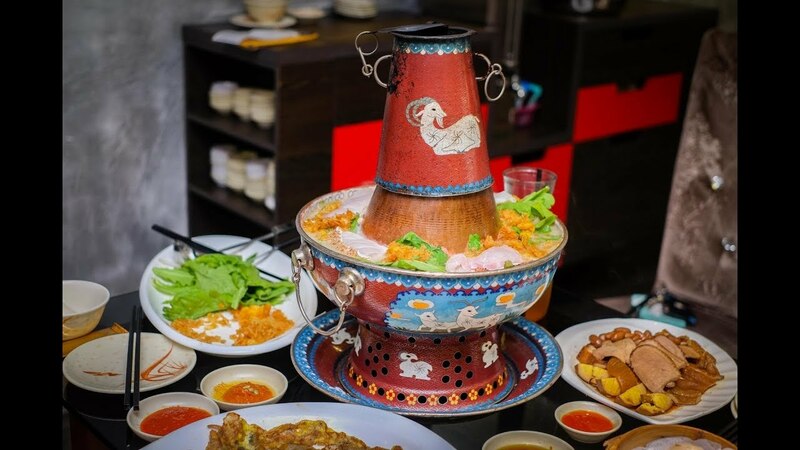 Typically served during get-togethers, family members and friends would toss and mix the ingredients together while shouting auspicious phrases for luck and good fortune. The higher you toss (and the more mess you make), the more effective those wishes are said to be. 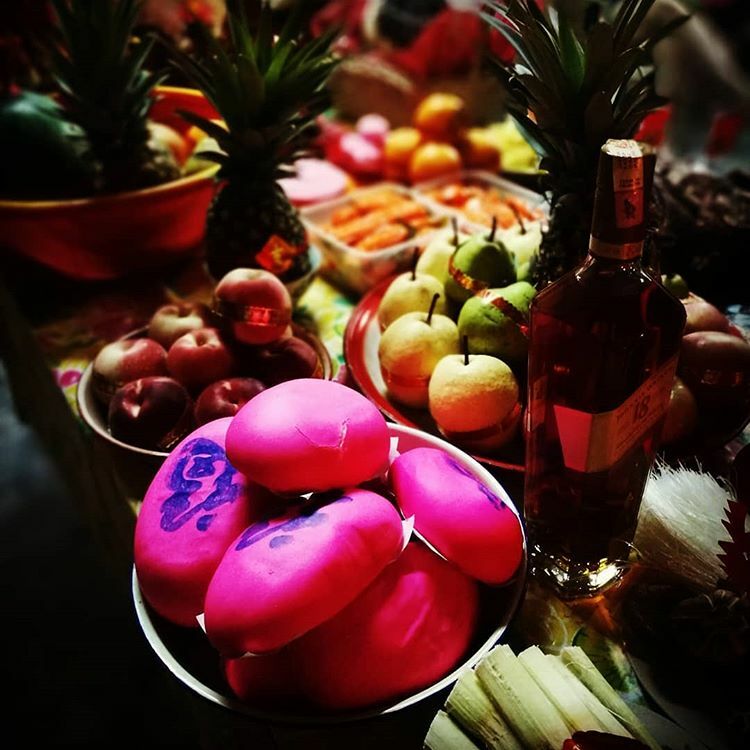 On the evening of the eighth day, Hokkien households would set up an altar table laden with offerings such as fresh fruits, roasted meats, dyed red eggs, sweet cakes, sugary confections, tea, and most importantly, sugar cane. Legend has it that a long, long time ago, the Hokkiens were spared from a massacre by Japanese pirates after hiding in a sugar cane plantation on the eighth and ninth day of the first lunar month, coinciding with the Jade Emperor's birthday. As "sugar cane" (kam chia) sounds similar to "thank you" (kam xia) in Hokkien, sugar cane is offered to express gratitude to the Jade Emperor. At the stroke of midnight, prayers would commence with intricately carved dragon-themed joss sticks. Firecrackers and fireworks will also be lit (sometimes even more so than any other day of CNY), followed by a bonfire of kim cua (joss papers) and a late-night feast. The Jade Emperor's birthday is considered the most important day of the lunar new year for the Hokkien community, with some schools and employers actually declaring it as a holiday for students and employees respectively. Chicken wings are often served to the youths so that they can "fly high" in their studies and/or careers. 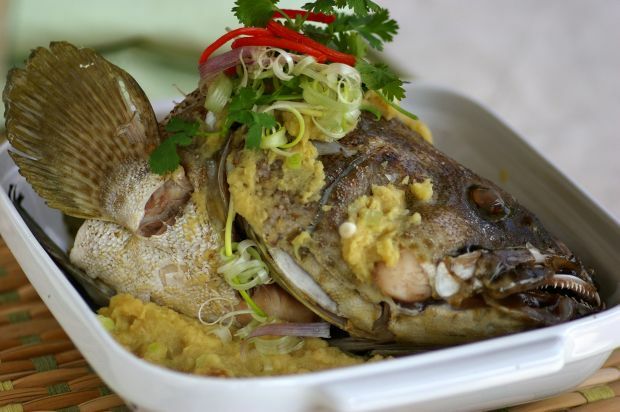 Fish heads are reserved for the elders to show respect for the elders, but the most coveted part of the fish has got to be its eyes - it is said that schoolchildren who consume fish eyes will do better in their studies. Devotees worshipping the goddess Nüwa. On this day, the Hakka - who are traditionally nomads - will cease all daily activities to celebrate the auspicious occasion by making offerings of steamed rice cakes and fried sticky rice balls with with needles in it to symbolise the tools the goddess stitched the sky up with. 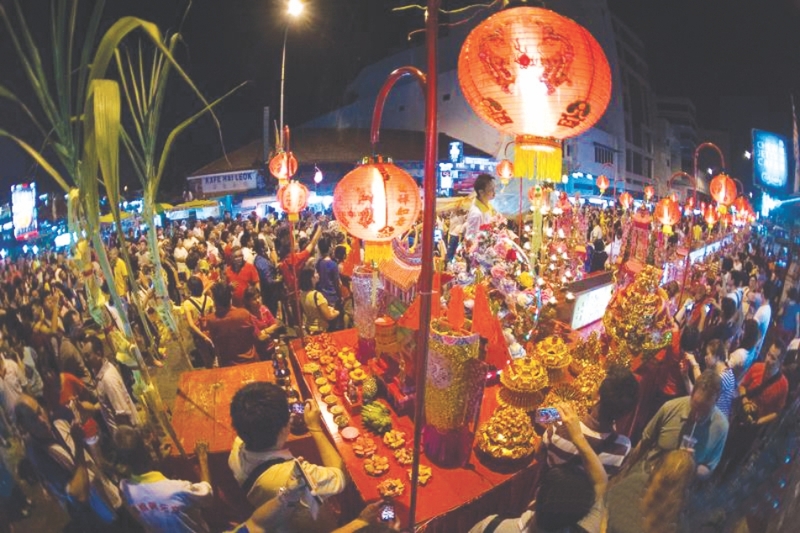 According to Selangor and Kuala Lumpur Fui Chiu Association president Russell Chia, Hakkas believe that this day symbolises birth, continuity of life, and a new start. Unlike the lion dance, the unicorn dance uses very high and low stances. According to Vision Times, the head of the unicorn moves in a circular motion from left to right and looking backwards as well as in little shaking movements, whereas the lion's head moves up and down with the dancers usually high on their legs. The unicorn dance is typically performed during Hakka festivals and celebrations, and is believed to ward off bad luck and bring in the good instead. Olives are an important fixture in the Teochews' CNY celebration. They are often given as gifts and served to guests during CNY, usually together with mandarin oranges. 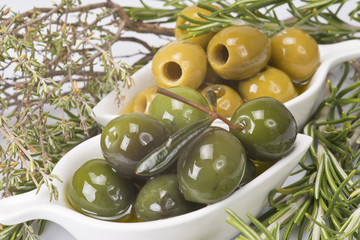 The use of olives in Teochew culture dates back to the Qing Dynasty, where they were traditionally used in prayers as well as a premium offering to the emperor. It probably also has something to do with the fact that Chaozhou, the ancestral home of the Teochew people, is one of the few places in China that produces olives. According to NLB, it is also tradition to not finish the dishes served at the reunion dinner so that there will be leftovers brought over to the new year, thus symbolising excess and abundance for the coming year. The leftover food will then be served on the first day of the new year. 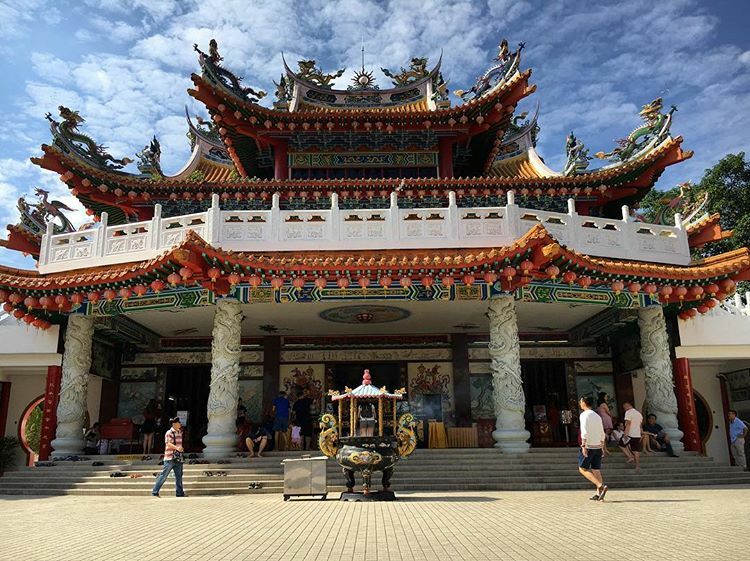 Thean Hou Temple in Kuala Lumpur. 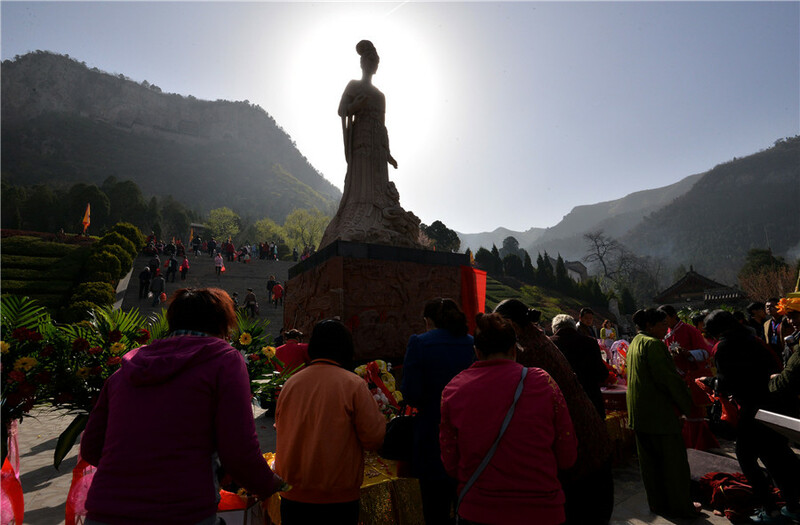 In the olden days, people on Hainan island - most of whom relied on the sea for income - would pray to the goddess Mazu to ask for safe passage before going on their voyages and sea escapades. 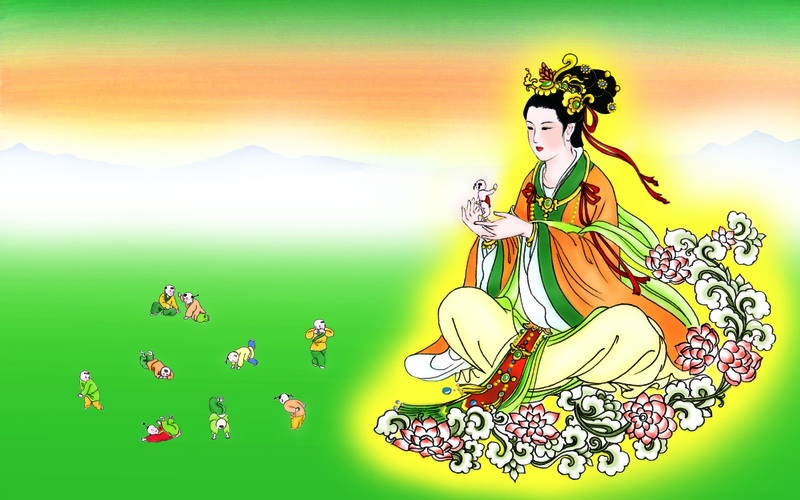 As such, Mazu is also known as the patron goddess of Fujian and Hainan provinces. Today, modern Hainanese pray to her for guidance and ask for blessing on their business and children's academic studies. 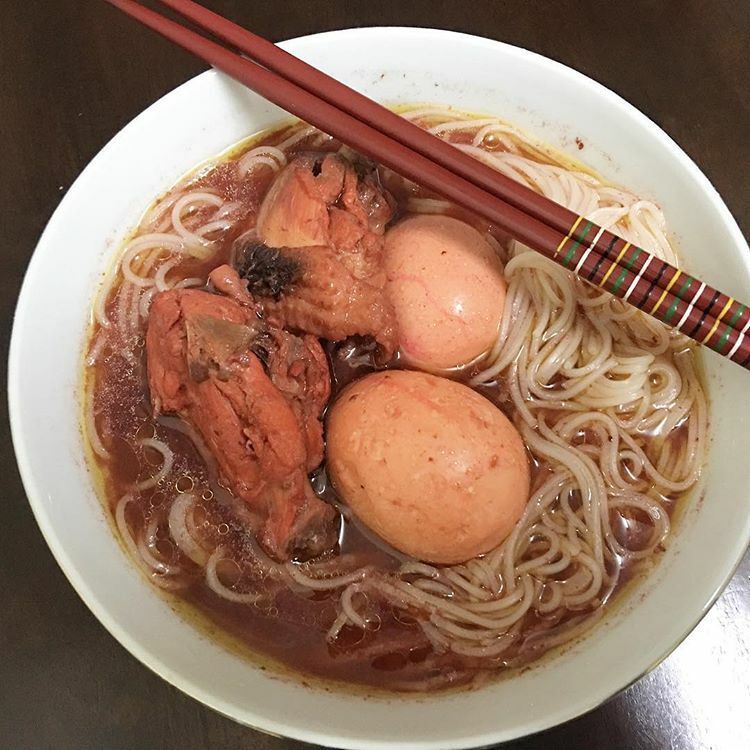 According to Selangor and Kuala Lumpur Foo Chow Association's Lin Siew Chin, the noodles will also be served with two hard-boiled eggs to wish for the diner's well-being in the new year. Do you have a CNY tradition or practice that's unique to your dialect group or family? Share it with us in the comments section below! Why Do The Chinese Give Out Ang Pows During Chinese New Year? In ancient China, ang pows are believed to ward off evil demons! To think, it's probably the the most popular CNY song in the world!